Don’t worry as Magento 2 Better Coupon by Mageplaza, in addition to it main features, will allow you to do just that. 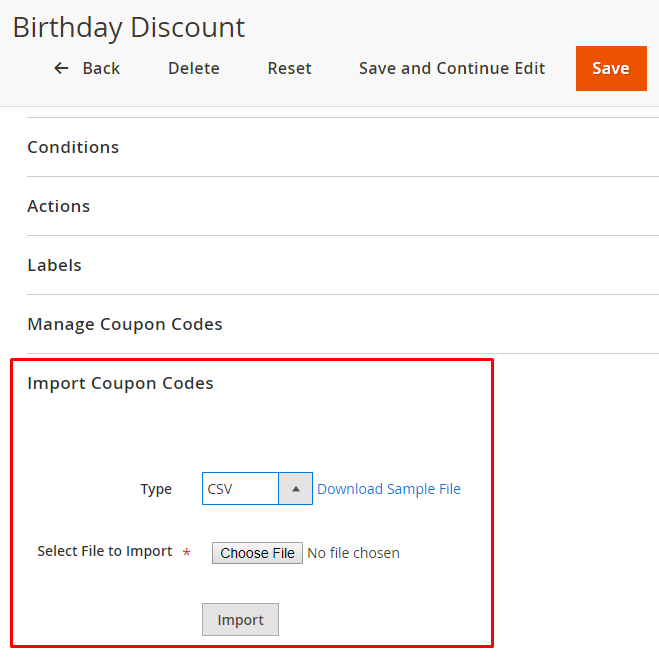 Below, you would find a step by step introduction how to coupon codes importation from a CSV file and from Text Area in Magento 2. Recommend: Use Mageplaza Multiple Coupons to help apply multiple coupons in Checkout or Shopping Cart page. 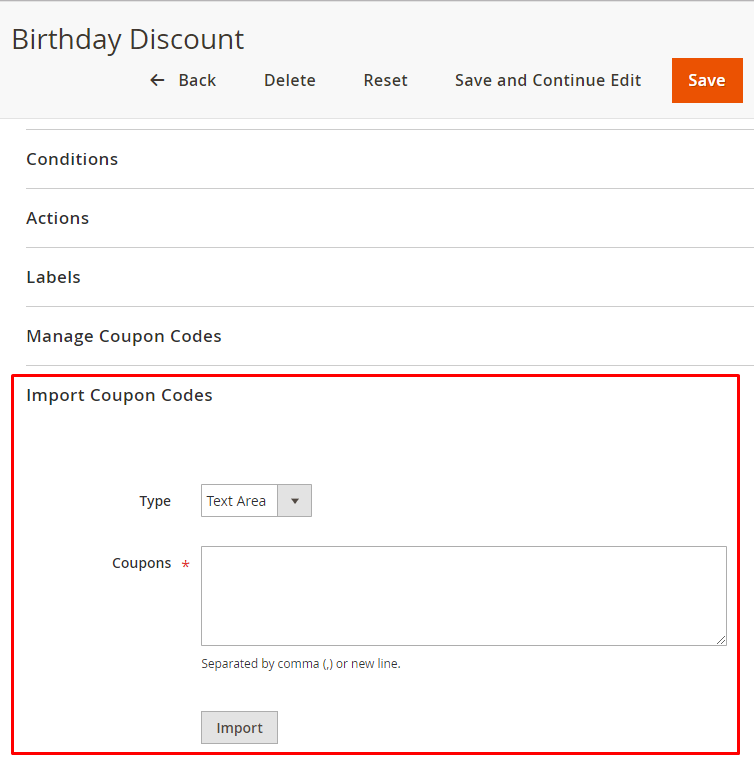 How to Import Coupon in Magento 2? First, go to Magento 2 Backend and look at the Admin panel on the left. On the panel, click on Marketing > Promotions > Cart Price Rules > Add New Rule. Scroll to the very bottom and you will see the option for importing Coupon codes. From there, it is very easy to see what to do next. In the field “Type”, there will be two options for you to import coupons. We would go through them one by one. Click on “Type”, choose import from CSV. Down below, an option for importing a file from your computer will appear. All that’s left is simply choosing the file you want import coupon codes and uploading it. What’s amazing about this feature is that it could automatically detect duplicate codes in your file. Identical coupon codes will not be added and the module will send you a message reporting on how many are repeated. On a side note, a CSV file is a plain text file that contains values made of texts and numbers. Values in the file are separated by commas, hence the name CSV (comma-separated values). If you want to see what a usable CSV file looks like, you can download a sample by clicking on the button next to the “Type” section. As a foresight, coupon importation can also be done by directly type into text area. This option is very convenient when you just want to implement a small portion of codes instead of the whole file. To import coupon code, simply paste them in the blank field below the “Type” field, or type them in manually. If you choose to do the latter, remember to separate the codes by either a comma or a break line. After being imported, your coupon codes will be ready to use, just like the ones created with the usual coupon generator. Code importation is a great way to create coupons. You don’t have to confine to only using the store-based generator, opening up the possibility of having someone else who is not store admins take care of codes creation for you. It’s also quick to do and is error-free. Aside from this one, Better coupon also has other functions just as neat like a quick link builder and pre-applied coupon link.